I was at Deepdale in Preston yesterday for the PNE game against Roy Keane's Ipswich Town. Both teams were on a run of bad form going into the game - PNE were bottom of the Championship, while Ipswich were on a five game losing streak. Going to and from Preston in a day means an early start - up at 5.00, Aircoach 5.47 to airport, Ryanair 7.45 flight to Liverpool (with loads of Everton fans), 9.00 bus to city centre, 9.57 train to Preston - arrive at 11.00. I met my brother Brian and his friend's son Jamie at about 12.00, and we went up to Deepdale for a corporate lunch in the Great Room. Lots of Christmas decorations, plus of course a turkey lunch. This corporate ticket was a Christmas present from Brian - thanks bro'! I really enjoyed the lunch - catching up with Brian, getting to know Jamie, and chatting to other PNE supporters. 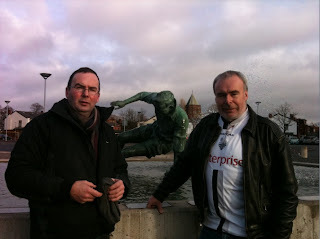 Brian and me at the Tom Finney statue. The great thing about corporate entertainment is you get to eat and drink in comfort, and then go out to one of the best seats in the house to watch the game. Ipswich dominated the early part of the game and should have taken the lead on a few occasions. 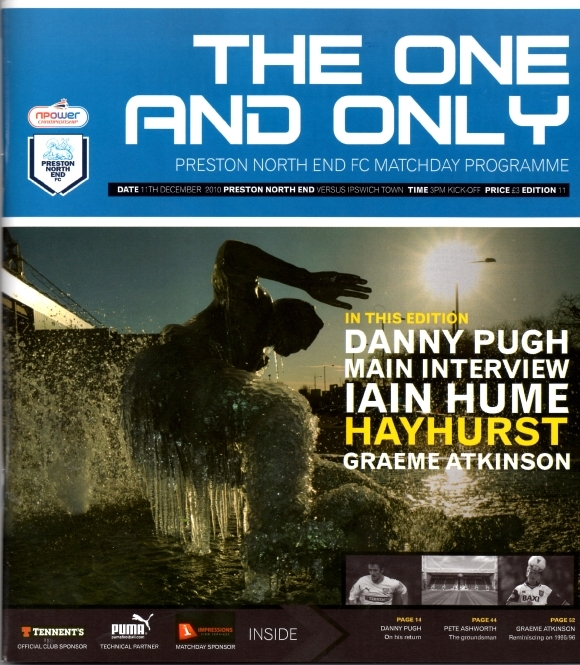 But PNE got stuck in, and by half-time had got back into the game, 0-0. Half-time was spent in the Great Room having dessert - very well organised. Just for a day I was one of the "prawn sandwich" (Roy Keane's words) brigade that disappears at half-time - we were back out just in time to see the second half kick off. Within five minutes PNE were in the lead thanks to a great move which was ended by on-loan Iain Hume finishing off a Beast pass - YESSSSS! PNE bossed the second half, with Brown and Cort at the back mopping up everything. While Hume was awarded the MoTM - I felt that captain Brown was the best player on the pitch. At the end we celebrated a well deserved 1-0 win along with about 9,500 other fans in the ground. See match report by the local newspaper, the Lancashire Evening Post here. No time at the end of the match to go back into the Great Room for tea and mince pies - I had to get a train at 18.00 back to Liverpool, followed by a taxi to the airport, just in time to make the 20.30 flight back to Dublin (Ryanair recently changed this regular flight from 21.30 to 20.30 - nice for Liverpool and Everton supporters, but not for PNE folk). The evening was rounded off with dinner at the Conrad Hotel with Roma's family - we got a great surprise when Roma's brother Edward announced that he and his partner, the lovely Karen, are getting married next summer - best of luck to you both! the one and only north end! A new fan I see! 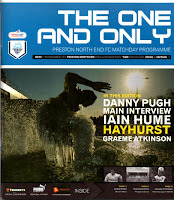 Go PNE! Hope you have many years of enjoying football - the only thing that matters. There are lots of other things that matter too - but you get my drift. E.